Europe has the perfect mix of ancient and the modern so when you board one of the River Cruises you get to explore all the timeless beauty Europe has to offer. Our European cruises will provide you with an unforgettable holiday experience along these great waterways. Monday  Our luxury coach will depart this morning and travel to our Eurotunnel crossing. Once in Calais we journey straight to Cologne with suitable comfort stops on route. We will arrive at our ship in plenty of time to settle in before dinner. Tuesday  Cologne to Andernach - Set sail early this morning, where youll pass Remagen, famous as the site of a World War 11 battle for the towns bridge. We then continue towards the pretty town of Andernach, one of the oldest towns in Germany, which is renowned for its impressive 13th century Liebfrauen church. Wednesday  Andernach to Cochem - We depart today on the picturesque Moselle River, fabulously set at the heart of the Moselle Valley wine-growing region. By lunchtime we have reached the enchanting medieval town of Cochem, overlooked by the colossal, 11th century Reichsburg Castle, perched high on a hill above the town and one of the most beautiful castles in the region. Thursday  Cochem to Rüdesheim - This morning, we cruise to Rüdesheim and on route, marvel at some of the Rhine Valleys most famous landmarks including the 130-metre-high Lorelei Rock, named after the Rhine Maiden sirens and the Mäuseturm, an ancient custom post now used as a beacon tower for shipping. The afternoon is free to explore Rüdesheim, a picture book wine town overlooked by the towers of ruined Ehrenfels Castle, and perhaps a stroll along the charming paved Drosselgasse. Friday  Rüdesheim to Cologne - We leave Rüdesheim this morning and continue back to Cologne where we moor-up overnight ready for disembarking tomorrow morning. Saturday  Cologne - After breakfast we disembark our ship and begin our return journey home. We head back to Wiltshire, arriving late afternoon to your awaiting taxis. 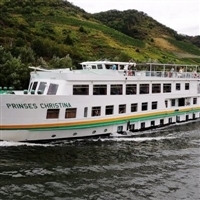 The MV Prinses Christina is a fully air-conditioned, comfortable ship with 54 newly renovated, outward facing cabins equipped with TV and en-suite facilities. There is an elegantly furnished restaurant on the lower deck that provides breakfast, lunch and dinner in traditional yet stylish surroundings. The lounge and bar on the promenade deck have picture windows that provide a panoramic view and it is here that morning coffee and afternoon tea are provided on a daily basis by your friendly and attentive crew members, all of whom speak excellent English and are always happy to help! There is a stair lift between the main and promenade deck and from the main deck to the restaurant on the lower deck. The large sun deck is partially covered.